The Taco Marine boat for charity gets completely revitalized from the bottom up in this episode. A new fuel tank is fabricated and installed properly and all wood rot is replaced by new stringers and bulkheads; to ensure that whoever wins this boat will practically have a brand new craft! In this informative episode of Ship shape TV, John and Friends build a floating dock so that John’s wife can easily board her boat. 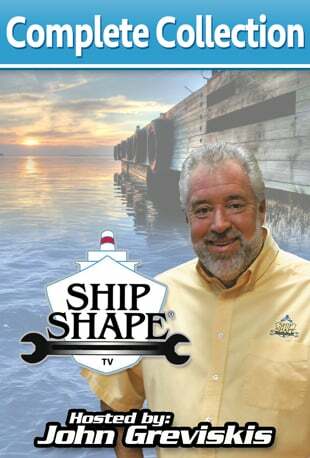 In this episode of Ship Shape TV, John wants to “Steer You” in the right direction when it comes to hydraulic steering. Rather than buying a new hydraulic system entirely, John enlists a company known for rebuilding systems like new. Watch the SSTV crew this week take a variety of boats and completely make them over and modernize them! From hatches to the hulls themselves, John and his expert friends in the industry discuss many ways to give your boat its own special look! In this exciting episode of Ship Shape TV, John and his friends are in Upstate New York refurbishing a windshield on a beautiful Chaparral. Also… John and Matthew Anzardo from Awlgrip teach us how to apply non-skid with a roller. Then.. it’s all about boat safety satellite equipment that could help save everyone in a tough situation! In Upstate New York, John and Friends replace old fabric on a boat with new manufactured by Ameritex Fabric Systems, a division of Taylor Made Systems. A camper cover is made and you are given a great explanation as to why owning one greatly expands the boating season. The Taco Marine Charity Boat is back in this exciting episode. This time we visit the guys at BoatOutfitters.com as they completely remodel the interior cabin… giving this old boat a new updated look! In this episode, John learns several different ways to get away from those cumbersome boat covers and cover your boat with ease. From specially made custom Mooring Covers to simple seat covers… this episode will show you how to bring some fun back to boating, while still protecting your vessel! Want to update your out of style hardtop? Well in this exciting episode of Ship Shape TV, the Taco Marine Project Charity Boat gets its hardtop completely re-fabricated from scratch. Learn how the Pros design and Weld this important structural piece for your vessel! The Ultimate Re-Fit contest winner gets some engine work done in this episode… specifically the water pump. Also, the center console gets a makeover that attractively stores the fire extinguisher. John Greviskis visits his son, Jonathan, on the west coast in Seattle, Washington. While there, John and his son discover what makes Seattle such a main force in the boating industry! They take us on a unique tour of the restaurants, industry, and the beauty of the area as well. We also learn a lot about downriggers and go fishing for Salmon. In this second grand episode of John’s trip to Seattle, John learns how to go Crabbing. We also take in the sights, sounds, and history of this famous port area as well as eat in some fantastic restaurants. Emergency! John has discovered that one of his diesel tanks on his 57′ Monterey had been leaking fuel into the bilge all summer! In this episode, John discovers what to do about this fuel leak situation safely and economically. Also… The crew of Ship Shape TV removes a fuel tank that has broken free underneath the deck of another project boat. John and company install and rigs a new twin set of outboards from Yamaha on the Taco Marine Project Pursuit Boat.